Next → Next post: I’m voting yes. There are no jaywalking laws in the UK, therefore no fines. 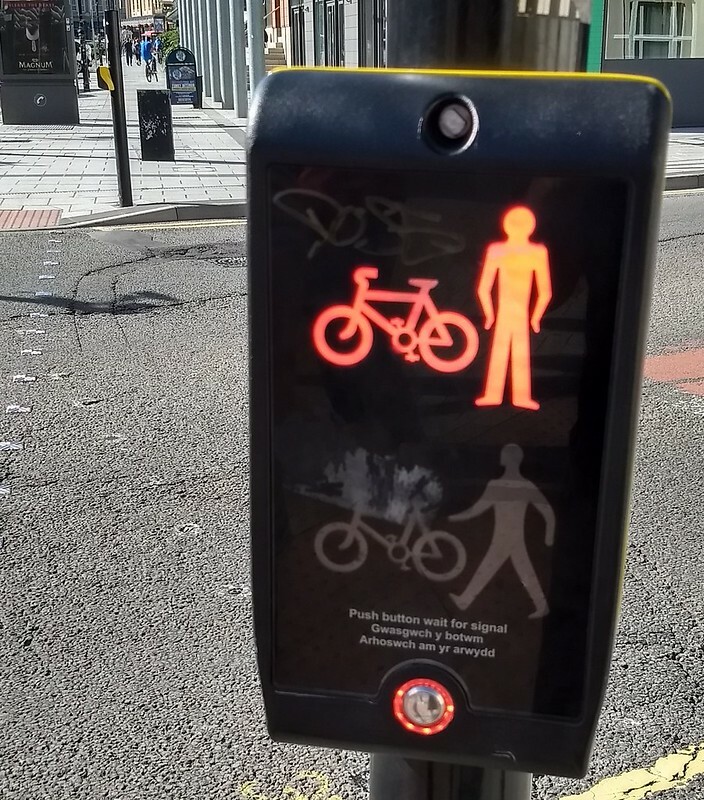 From my UK traffic engineering days the one with the pedestrian lanterns on the button are called Puffin crossings. These sense pedestrians and set the green time to cross depending on how many pedestrians are crossing and how fast they are walking. They are fairly common in the uk but are not the main type. In keeping with the bird theme the normal crossing type is called a Pelikan Crossing, bike/peds are known as Toucan crossings and Horse/peds are known as Pegasus crossings! On a side note there has been a huge shift in recent years on UK road design. The new standard is in publication called “The Manual For Streets”. I haven’t used it in a long time, but I think (could be wrong…) that you didn’t have to press the button for the second side, it would trigger in sequence after the first side. It was only if it was busy with people crossing both ways that it was out of sync and you had to wait in the middle. I couldn’t think of any other crossings, but then realised that there were three nearby on Springvale Road (Whites Lane, Wilson Road, Tolmie Way), all where you cross to the median. I know that for at least two (Whites Lane and Wilson Road) you had to press the button once you got to the middle. Yes, you find this kind of thing *all over* the UK. I gather it owes a lot to the influence of Colin Buchanan’s “Traffic in Towns” report from the 1960s and its ‘accommodate or ban’ prescription for motor vehicles. Hard segregation of pedestrians with barrier fencing and other such measures were a big part of this – on the one hand it favoured excluding vehicles and creating exclusive pedestrian precincts, but in other places it took the converse approach of excluding and marginalising pedestrians in road environments. And many towns found that in practice doing the latter is much easier than the former. I don’t know if you came across this, but priority at junctions differs in the UK to Australia. If I understand correctly, there is no priority for pedestrians crossing a road at a side street, over turning traffic. Further, if a pedestrian is crossing a side street with a green pedestrian signal, the road going in the same direction cannot also have a green signal. A similar crossing in Australia would give pedestrians a green at the same time as cars going the same way, and cars that wish to turn would give way to pedestrians. Given this, most major streets set the pedestrian crossing further away from the junction. This allows cars to turn left and then wait immediately at a red light. Pedestrians are generally boxed into two-stage crossings to permit more cars to fit through a cycle. This alone won’t fix two-stage junctions, but will allow more flexibility in timing of lights and planning of junction designs. Like Stephen says, there are certainly exaples of this practice in Melbourne. Opposite St James Park in Burwood Road Hawthorn is another. Press button and wait to cross westbound traffic, walk across the tram lines unassisted, press button and wait to cross eastbound traffic. I don’t know more than a dozen words of Welsh, so I am not going to understand the instructions. Such crossings are quite commonly used here where there are wide boulevards with trams in the centre and a platform stop is built. You are quite right, when people have to wait to long, they will cross against signals. I am sure this is well known by road planners, and it seems, ignored. @Tony, thanks for that – that puts some context on it. @Jeremy, very interesting thanks! I hadn’t figured that out. Surprised they’ve lagged on a simple rule change like that. Thanks for all the other comments too. Of course, there are examples of staggered (and unsynchronised) crossings, particularly on the wide tram boulevards. Thankfully not on narrow streets like those in Cardiff however. I grew up with these kind of staggered crossings on many major roads in Singapore. Come to think of it, I’ve seen a few of these sort in Melbourne too. Laverton North (Federation Trail on Fitzgerald Rd) and Altona Meadows (near Central Square) comes to mind but they are often timed to go one right after the other depending on which side calls for crossing first. Seems the bottom of my original comment got cut off. “The Manual For Streets” which is now the UK’s offical street design handbook is well worth reading if you are interested in active transport. It shows have streets can be made safe and inviting for walking without resorting to pedestrian fencing etc. It takes away the previous engineering focus and replaces it with a place making focus. 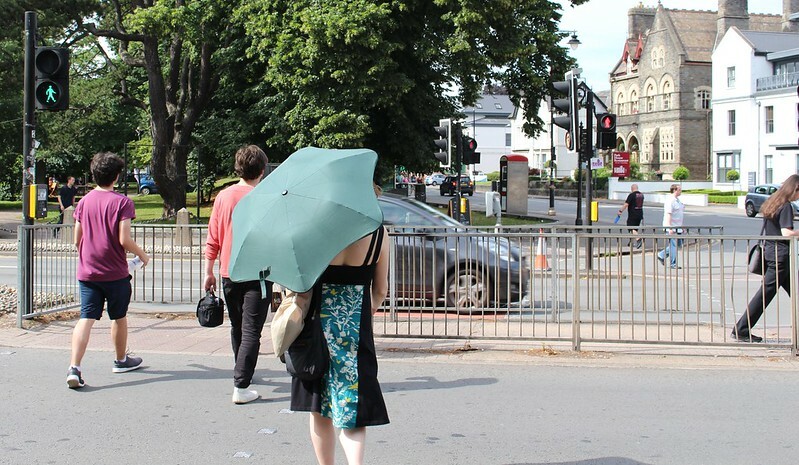 As mentioned above the jaywalking concept doesn’t exist in the UK. I grew up there and in general took a red pedestrian light as advice only and if the road was clear crossed when safe. After 10 years I still find the enforcement of jaywalking laws here quite odd, but do try and comply. I’m not sure Australia gets off so easily, in this regard. I had the misfortune to venture out of my inner suburban bubble, not long ago, and found that the waiting period for pedestrian lights down in the Edithvale / Chelsea area were unreasonably long. At intersections with right turn phases on divided roads, divided crossings could be used to allow pedestrians to legally cross the carriageway(s) with stopped traffic while the right turn traffic is turning into the other carriageway, shortening legal waiting times and increasing pedestrian obedience of signals. This reminds me of a set of lights just north of Eastland Shopping Centre (Ringwood). Or two sets of lights, since pedestrians are stopped in an island in the middle of the road with a second crossing, just like in the first picture. If you are intending to cross the Ringwood Bypass (heading north) on the west side of Ringwood Street, pressing the button will cause the green man to appear on the opposite (northern) side of the road and give a green arrow for cars to head west immediately in front of you – I have seen countless people start walking the instant they hear the pedestrian signal despite the green man being on the far side of the road, with them nearly getting hit by a car. 90 (or is it 120?) seconds later, the green man finally lights up and you can finally walk half way. Of course, by the time that happens, the red man for the other side is long since up and cars on the Ringwood Bypass are waiting for the green light. Welcome to another 90 (or 120) second wait for the full traffic light cycle. If you are heading south over the bypass however, pressing the button will give you a green man almost immediately (at least if you didn’t miss the light cycle), followed by another green man at the island too. Interestingly, there is a grade separated crossing heading underneath Ringwood Street parallel to Mullum Mullum Creek (immediately north of Eastland), but no other grade separated crossing in the area (there is also a huge green monstrosity of a pedestrian bridge over the bypass a few hundred metres west of Ringwood Street but it’s in the middle of nowhere, not really useful unless you were local to that area – it also has the typical gigantic “DDA-compliant” zigzag ramp leading up to it from the southern side, which of course takes forever to scale). Speaking of Ringwood, bonus points for them not bothering to build the pedestrian bridge from Ringwood station over the Maroondah Highway (even if it didn’t connect with Eastland), forcing everyone to cross the highway at grade and most likely missing their train or bus in the process. Of course the lights don’t change immediately, they wouldn’t want to make the incredibly slow 40 km/h traffic go any slower through there! I suppose we’re lucky the bridge even went over the bus bays, as even those have pedestrian lights outside platform 3 rather than having a zebra crossing! Jaywalking is also not illegal in England & Wales, which probably contributes to it. I think technically cars are always supposed to give way to pedestrians – so everywhere’s a crossing, in that sense.